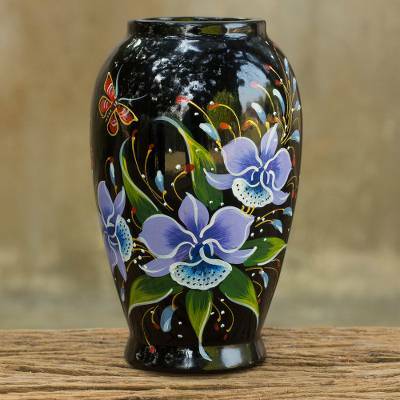 Handpainted Thai Lacquered Wood Decorative Vase, "Purple Cattleya"
Purple cattleya orchids welcome a cheerful red butterfly into their midst in the hand-painted composition of this decorative vase. Subin Tositarat presents a gorgeous vase carved of mango wood and finished with Thailand’s legendary lacquer work. Originating in China, the art of lacquer ware has blossomed over the centuries in Chiang Mai. 12.5 cm H x 7.5 cm Diam. 4.9" H x 3" Diam. You can find lacquered wood decorative vase 'Purple Cattleya' by Subin Tositarat in vases categories such as Floral Vases and Wood Vases. Enjoy exploring these sections for other Novica treasures. "start of a new collection"
Very beautiful, but smaller than I imagined. Dear Mr. Tositarat, I am so very, very pleased with your mango wood vase. The hand painting is fabulous, as well as, the colors in your design. You have a very special talent and I am so happy to be able to purchase your vases thru Novica.